This Conflict of Interest Policy ("Policy") is intended to protect NYSOBBA’s interests when entering into a transaction or arrangement that may either personally benefit a member of NYSOBBA’s Board of Directors or committee or may result in an excessive benefit transaction. This Policy is intended to supplement – but not replace – any applicable state and federal laws governing conflicts of interest applicable to nonprofit and charitable organizations. A Contract or Transaction between NYSOBBA and a Responsible Person or Family Member. A Contract or Transaction between NYSOBBA and an entity in which a Responsible Person or Family Member has a Material Financial Interest or of which such person is a director, officer, agent, partner, associate, trustee, personal representative, receiver, guardian, custodian, conservator or other legal representatives. A Responsible Person competing with NYSOBBA in the rendering of services or in any other Contract or Transaction with a third party. Responsible Person’s having a Material Financial Interest in; or serving as a director, officer, employee, agent, partner, associate, trustee, personal representative, receiver, guardian, custodian, conservator or other legal representative of, or consultant to; an entity or individual that competes with NYSOBBA in the provision of services or in any other Contract or Transaction with a third party. Under circumstances where it might be inferred that such action was intended to influence or possibly would influence the Responsible Person in the performance of his or her duties. This does not preclude the acceptance of items of nominal or insignificant value or entertainment of nominal or insignificant value which are not related to any particular transaction or activity of NYSOBBA. 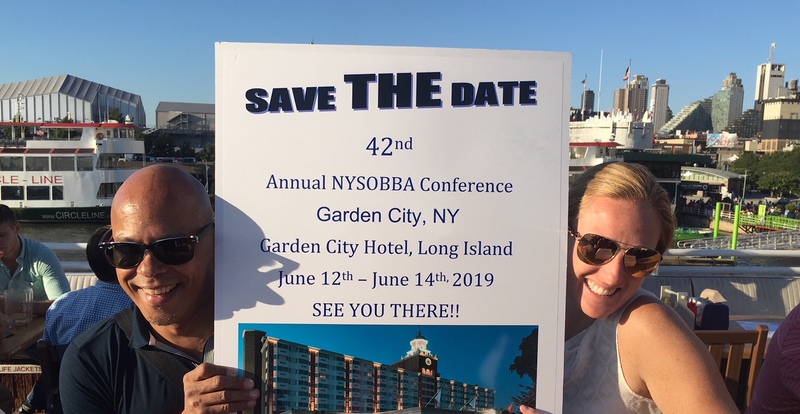 SECTION 2 – Responsible Person: Any person serving as a member of the Board of Directors or as a member of any NYSOBBA committee. SECTION 3 – Family Member: A spouse, domestic partner, parent, child or spouse of a child, brother, sister, or spouse of a brother or sister, of a Responsible Person. SECTION 4 – Material Financial Interest: An entity is a financial interest of any kind, which, in view of all the circumstances, is substantial enough that it would or reasonably could affect a Responsible Person’s or Family Member’s judgment with respect to transactions to which the entity is a party. This includes all forms of compensation. SECTION 5 – Contract or Transaction: Any agreement or relationship involving the sale or purchase of goods, services, or rights of any kind, the providing or receipt of a loan or grant, the establishment of any other type of pecuniary relationship, or review of a charitable organization by NYSOBBA. The making of a gift to NYSOBBA is not a Contract or Transaction. SECTION 1 – Prior to board or committee action on a Contract or Transaction involving a Conflict of Interest, a director or committee member having a Conflict of Interest and who is in attendance at the meeting shall disclose all facts material to the Conflict of Interest. Such disclosure shall be reflected in the minutes of the meeting. SECTION 2 – A director or committee member who plans not to attend a meeting at which he or she has reason to believe that the board or committee will act on a matter in which the person has a Conflict of Interest shall disclose to a board member all facts material to the Conflict of Interest. The board member shall report the disclosure at the meeting and the disclosure shall be reflected in the minutes of the meeting. SECTION 3 – A person who has a Conflict of Interest shall not participate in or be permitted to hear the board’s or committee’s discussion of the matter except to disclose material facts and to respond to questions. Such person shall not attempt to exert his or her personal influence with respect to the matter, either at or outside the meeting. SECTION 4 – A person who has a Conflict of Interest with respect to a Contract or Transaction that will be voted on at a meeting shall not be counted in determining the presence of a quorum for purposes of the vote. The person having a conflict of interest may not vote on the Contract or Transaction and shall not be present in the meeting room when the vote is taken, unless the vote is by secret ballot. Such person’s ineligibility to vote shall be reflected in the minutes of the meeting. For purposes of this paragraph, a member of the Board of Directors of NYSOBBA has a Conflict of Interest when he or she stands for election as an officer or for re-election as a member of the Board of Directors. SECTION 5 – Responsible Persons who are not members of the Board of Directors of NYSOBBA, or who have a Conflict of Interest with respect to a Contract or Transaction that is not the subject of Board or committee action, shall disclose to a board member any Conflict of Interest that such Responsible Person has with respect to a Contract or Transaction. Such disclosure shall be made as soon as the Conflict of Interest is known to the Responsible Person. The Responsible Person shall refrain from any action that may affect NYSOBBA’s participation in such Contract or Transaction. In the event it is not entirely clear that a Conflict of Interest exists, the individual with the potential conflict shall disclose the circumstances to a board member, who shall determine whether there exists a Conflict of Interest that is subject to this policy. Each Responsible Person shall exercise care not to disclose confidential information acquired in connection with such status or information the disclosure of which might be adverse to the interests of NYSOBBA. Furthermore, a Responsible Person shall not disclose or use information relating to the business of NYSOBBA for the personal profit or advantage of the Responsible Person or a Family Member. SECTION 1 – Each new Responsible Person shall be required to review a copy of this policy and to acknowledge in writing that he or she has done so. SECTION 2 – Each Responsible Person shall annually complete a disclosure form identifying any relationships, positions or circumstances in which the Responsible Person is involved that he or she believes could contribute to a Conflict of Interest arising. Such relationships, positions or circumstances might include service as a director of or consultant to a nonprofit organization, or ownership of a business that might provide goods or services to NYSOBBA. Any such information regarding business interests of a Responsible Person or a Family Member shall be treated as confidential and shall generally be made available only to the President and any committee appointed to address Conflicts of Interest, except to the extent additional disclosure is necessary in connection with the implementation of this Policy. SECTION 3 – This policy shall be reviewed annually by each member of the Board of Directors. Any changes to the policy shall be communicated immediately to all Responsible Persons.